Blank Noise asks you to discard one garment that you wore when you were sexually harassed or 'eve teased' in a public space. This collective building installation of clothes seeks to defy the assumption that we 'ask for it', or that only people in 'provocative' clothes; 'immodest women' get eve teased. take a stand. stop blaming yourself. your clothes. your body. Build testimonies. Blank Noise was initiated in 2003. In its first phase Blank Noise comprised of a series of workshops conducted with a group of nine girls from the Srishti School of Art Design and Technology. The workshop explored the public and private identities of the nine girls and was translated into an exhibition for an audience that was viewed as victim, perpetrator, or mute spectators of street harassment. In its current stage, Blank Noise is seeking wider participation and audiences. The project is currently located on Brigade Road. A series of performative and participatory experiments involving the public will be conducted on this site. Within Blank Noise, one of the experiments being conducted is “DID YOU ASK FOR IT? ” When attacked on the streets the first thing we look at is our clothing. We question if we ‘provoked’ or ‘asked to be made victim’. 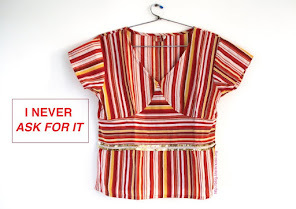 The garment worn at that point of time contains a memory and is witness to an experience thus becoming a testimony. Blank Noise is not a gender specific project and I look forward to your participation. There is power in numbers. I have faith in the collective. The supporting material and further information will be provided on request. We experience eve teasing daily. It is a sexual violation but we ignore it. At the same time, we structure our lives to avoid the occurrence of it - by 'dressing decently', 'coming back home on time', etc, thereby making unwanted rules for ourselves and not recognizing ourselves as citizens. Blank Noise was initiated in August 2003 by Jasmeen Patheja from Bangalore and a small group of 9 all girl participants. 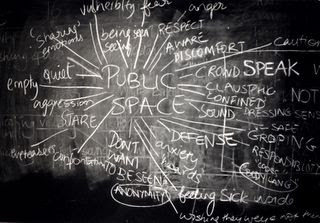 Jasmeen started by askinga group of over 60 girls from Srishti to make a mind map with the word public space.In three minutes words such as groping, fear,vulnerable, weak, staring, feeling sick appeared. She proposed the project but only 24 of them responded. The rest felt it was 'normal' or that it 'wasn't a big deal', almost as if you expect it and, therefore, accept it. The first phase of the project, throughout 2003, was more reflective with 9 participants and workshops. The second phase has been more public, through street interventions and blogging. To a large extent, the public and the media response have shaped the project. The first phase of Blank Noise dealt with victimhood. We began with a series of workshops, which explored the public and private identities of these nine women. This collective participatory experience evolved into an installation that included video, sound and photographs. With this installation Jasmeen tried to address the victim, the perpetrator and the silent spectator as members of the audience. The next phase involved public confrontation. 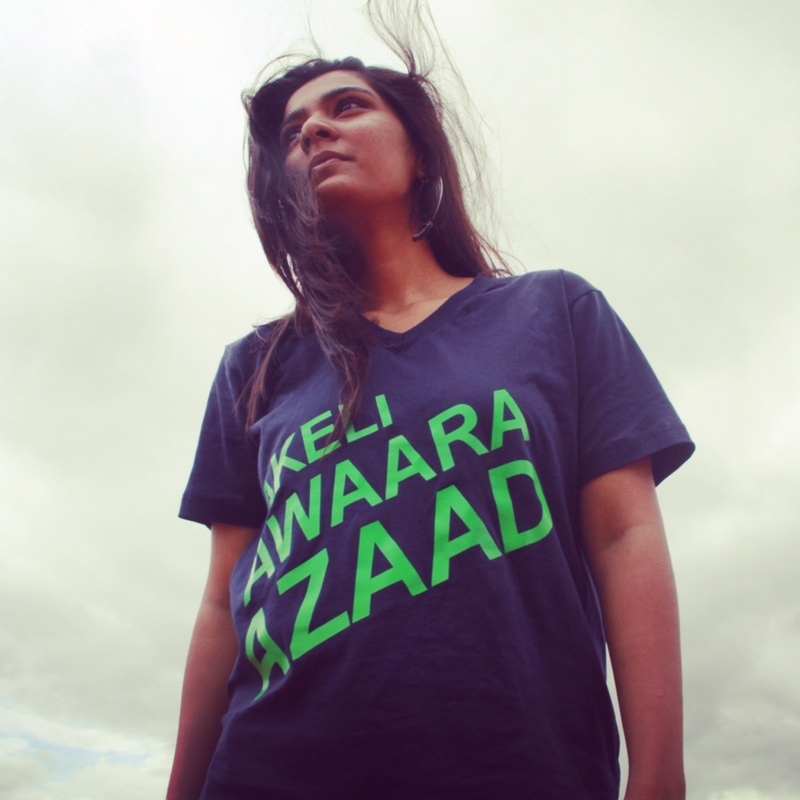 With a grant from Sarai and support from Srishti Jasmeen envisioned Blank Noise as a participatory, public art project where she could take the issue to the streets, while including a wider base of participants. In its current stage, the project has a diverse set of participants, who include college students, performance artists,researchers, young professionals, etc. We are currently working on public interventions that are performative in nature. 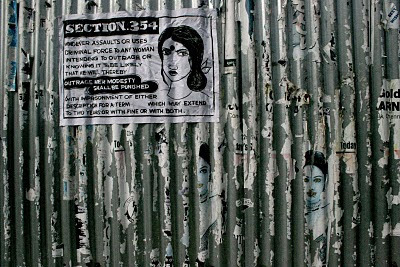 This stage of the project has us disseminating and questioning the law (particularly Section 354 of the Indian Penal Code, which deals with outraging the 'modesty' of a woman). Through opinion polls, we are also attempting, most importantly, to be able to define eve teasing, which is such an open-ended and frivolous term. What does all of this aim at? What are you trying to achieve? We don't believe that one policy change or one street intervention, or one media report can change the world. We have to address the issue from multiple avenues over a period of time. Eve teasing is a societal issue, has its roots in patriarchy, reflects in films and in our popular culture. We are proposing to initiate a transformation, start the dialogue, through recurring public events, public participation and collaborations. We are looking at communicating, through participation, with policy-makers, as well. Blank NoIse is interventionist, and critically reflective of the issue. It seeks to confront, and create communitoes through public art. Blank Noise works with people through performance, blogging, and street interventions. 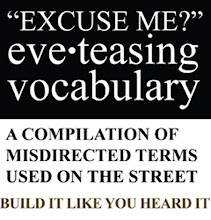 This is a public art project seeking to address eve teasing. There are several ways to address an issue and we choose the language of public and community art. Often people try to understand us by saying " it's great. you're using art to address social change". No we're not 'using art' ; we don't see art as a 'thing' that enables making 'visuals'. Rather , we work like artists in the way we perhaps open space for enquiry. It lies in the approach. But art has, throughout history, played a significant role in social change. Even in contemporary times, artists like the Guerilla Girls, Peggy Diggs and Gran Fury have brought about change in societal attitudes through their art – on billboards, bumper stickers, posters and even milk cartons. For instance, since Peggy Diggs was concerned about domestic violence, she printed her message on milk cartons, which women bought. Gran Fury collaborated with activist groups and created billboards, confronting the public with the social stigma attached to AIDS. What, then, is Blank Noise doing? Blank Noise works with media that is both mainstream and alternative, depending on the nature of the project undertaken. 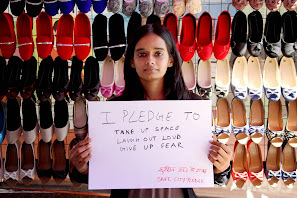 We hope to gather clothes across different cities as testimonials of eve teasing and install them on the streets. We hope women will stop blaming themselves, your body, your clothes. What Blank Noise hopes to do is bring together 1000 clothes, install them on the streets, in public spaces and collectively defy the notion of 'modesty'. Women camera and the internet. There could be innumerable approaches on self defense, on protecting yourself. What works for us, is the camera. You could get even with your eve teasers, reverse the position of power through just one click. We have had experiences where people have apologized, admitted, felt shame for sexually harassing us. These pictures are then put online, Our friends in New York, HOLLABACKNYC are doing precisely this, It works! We swear by it! The action of taking a picture of a perpetrator leching/ groping/ whistling/ catcalling is empowering in itself, through this simple act we reverse the gaze. * Why R U looking at me? In this intervention, each woman wears one alphabet around her neck and we spell out the sentence on busy sidewalks, at traffic lights, in a mall, in any public space. And it's done silently. No-one speaks, no-one answers. There's only one probing question being asked – why are you looking at me? * One Night Stand: this intervention needs women, by the numbers. We are on the street, on specific sites, significant to each city and simply, STARING. it will reverese the situation. there is power in numbers. this is experiential for both the performers and the public in the site. This performance is implicit. all participants are asked to dress in clothes they would not otherwise. - One Night Stand looks at women occupying spaces- literally by just standing around. " why are these women standing here?" Is that a question to be asked in the first place? Is it all about the women? It may be called 'eve' teasing and spoken of as if it happens only to women but we have found that men also experience street sexual harassment. They just have a different way of looking at their bodies and dealing with the issue. As women, we are taught to protect our bodies and we are layered with ideas of modesty and shame. Izzat. Lajja. Men are expected to be men – mard - and they are supposed to deny that they can be victims, too. So a roughly typical reaction might be – yes, I got felt up but I pity the bugger because he's gay. Eve teasing, therefore, despite its rather misleading nomenclature, is not an all-girl issue but a societal one. 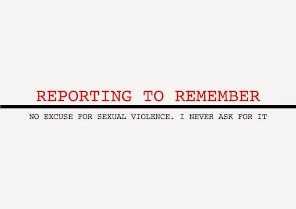 By being a mute witness, by teasing (sexually harassing) or by ignoring/ denying the issue, we are responsible for it. There's no one person. While Jasmeen Patheja is the founder member- today the project has evolved into a a people's project where different members adopt different roles and taken on multiple tasks to keep Blank Noise going! Every blogger that has participated in our campaigns has built the project. Every email, every public response shapes the project. Blank Noise believes that you are the agent. Today Blank Noise team is a pool of many people with different skill sets. All members are volunteers from different parts of the world. Sujata Bhat in Chicago handles public relations, Abby Baxi, Amit Kendurkar, Ambrish Bansal and Uday Prakash have always worked on the technical aspect of the blog. Annie Zaidi and Abigail Crisman have been handling and nurturing the Delhi project. The role of the volunteer evolves over time and varies based on the committment level of every partipating volunteer. How do I know if I fit in? What does it take? All you need to do to join Blank Noise is get in touch with us. If you feel strongly enough about eve-teasing and are willing to do something about it, Blank Noise would be glad to have you on board. And we can use any skills you have from writing to artwork to design to being net-savvy or just being willing to give your time to spreading awareness. But the rider is that we are open only to those who are committed enough to go beyond articulating an opinion. To join the Blank Noise team, you must be able to reflect and take collective action. There are core areas where you can join an existing team. We also have regular interventions, which you can participate in. Or, you can propose a new idea, a new intervention, a new area of focus and go ahead by forming a team. Currently, Blank Noise participants include researchers, college students, journalists, technicians, activists, an architect, and young professionals. There are both men and women, and just happen to fall between the age groups of 17- 30 years. 4. Research – Apart from researching street sexual harassment and related issues, we need to archive the testimonies and compile findings from the opinion polls. 5. Interventions – To participate regularly in our street interventions and also suggest and implement them. A big thank you to Maesy Angelina for thinking, questioning and reflecting on the Blank Noise approach. We recommend reading through her posts to know more about us.